Our 'Best Auntie' mug is the perfect gift for any Auntie. 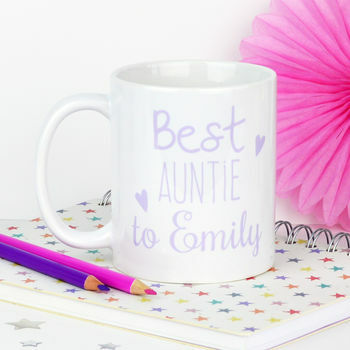 These mugs make the perfect gift for any occasion, Birthdays, Valentines, Christmas, Weddings, Anniversaries, Easter, Mother's Day, Fathers Day, or if you just want to treat a special family member or friend! These cups are Ceramic and dishwasher safe. Cup height is 10cm, diameter is 9cm.